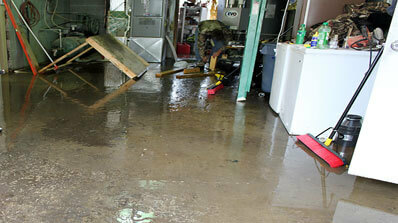 Water Damage can destroy the concrete floor, concrete walls, and wood surfaces of shelves on the walls of your garage. Let’s face it, most homeowners aren’t concerned with possible water damage to their garage, unless a storm brings in flooding. The garage is usually seen as a space that doesn’t require much maintenance work, and in some cases that’s a correct assumption. If a garage is constructed properly, it should be a strong and safe structure that contains few fittings, pipes, and surfaces for water to infiltrate and cause damage. However, never say never when it comes to possible water damage to your garage! The concrete floor, concrete walls, and wood surfaces of shelves on the walls can all be subject to water damage. When such damage does occur, it’s often unexpected. Be careful when inspecting a possible damage area as items may compromised. If you check your plumbing on a regular basis, you’ll find that there are plenty of chances for water to find its way to these surfaces. Be sure to inspect all pipes for rust, leaks, and possible mishaps such as large objects interfering with the piping. These accidents can happen anywhere in your home, however they are more likely to occur in a garage which isn’t often climate controlled. If you’ve experienced a major spill in your garage, you will need to get it cleaned up as soon as possible. The concrete floor can sustain water damage, staining, and other problems if the water remains for too long, and the walls can lose some structural integrity as well. The longer you wait, the worse the damage will get. Having a problem with water damage in your garage? Don’t delay – you’ll need an expert to handle the situation. Don’t wait while the problem becomes worse! We at Orange Restoration are fully capable of dealing with any type of emergency. All of our technicians are fully certified and trained in all facets of damage restoration. We will respond quickly and get your property back to its original state in no time at all. We are available for 24/7 emergency services. Give us a call today!